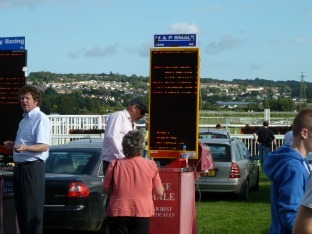 But here is one betting system that has stood the test of time. Did the horse win in the past 4 days? "Given that many trainers are in fact canny fellows and do know their stuff, it has been determined that if a horse is entered into several races, or at any rate more than one, within a four day period then that horse is in good racing trim and given a fair chance that on the day he will win again. So check each race on any given day for all horses that won last time out that have run in the last four days. Do not deviate and assume five days is okay. Long experience has shown that it is not. Four days or less. If there is more than one horse in this category then check from past racing pages. Also check the distance he won at and the going. If the going is no worse on the day of the bet than last time, if the company was no less illustrious and the distance is not significantly greater,then punt. I have found that if one is going to follow a winning betting system then you have to do a small amount of investigation and study if you are going to succeed with any consistency. If you simply look at a paper and pick a horse you will hit only slightly better than average. No, What you should do is take a paper you trust every day. My own preference is the Mirror, but both the Mail and the Express are reliable. Whatever you do, don't read the wretched papers. a) you don't have time and b) they are mostly rubbish. So carefully remove the racing pages, both yesterdays results and today's details of the meetings, runners and riders. If you don't understand all the letters and figures there will usually be a little legend tucked away somewhere at the bottom of the page that tells you what they mean. These figures are the meat of our betting system. If not, go to the nearest bookmakers and tell the first knowledgeable looking cove you come across and ask what these figures mean. If you are using The Mirror, the figures you are interested in are the ones in brackets, for this horse racing and betting system, immediately after the horses name. That is the number of days since he last raced. Then the string of figures on the left of the horse's name. These will be his placings over his last six races. If your chosen horse won in a field of D class racers last time out and this race is an A class race then beware - if it is an F class then you are safer. Just a tip. Keep your racing pages in date order in a file, it makes them so much easier to handle. There is of course in all this the handicapper to take into account. He is a very canny fellow and his job is to seek to add weight to the best horses to improve the chances of the lesser cattle. And he is very good at it. But that is the fun of your chosen hobby, beating the handicapper. There is a school of thought that says that if at all possible, avoid punting on handicaps and stick to sellers plates and maidens stakes. I do not subscribe to this school myself. Of course, the SP will reflect an obvious potential winner but if you are going to succeed in this system you have to be rigorous. If there is a four day horse that won last time out you have to back it at whatever price. If you are actually punting at the bookies and this is much more fun of course, then you can always ask the manager if you can take a price with him and you may get better than the SP, but you may get worse! It is only if there are several four day horses on any one day that you should look for the best chance by reference to the other factors referred to above or check the opinion of a similar system. A few words on the actual amount to punt. For any betting system you should allocate yourself an amount as your season's stake say 100 pounds sterling. Then you need to decide on a daily stake. I started off with a five pound win bet. Stick to it religiously do not make the classic losers mistake of chasing losses. If you lose, go on to the next day with a rueful smile and the same value bet. Bet on at that rate without variance until you have won your original 100 pounds allocation, then you can increase your stake to 10 pounds and so on. What about the each way bet I hear you cry? Well if you have an uncertain bet, then so long as the odds are greater than 5-1 against, you can safely make an each way bet. If the horse wins then you are quids in, if he losses you will get a fifth of the odds as a pay out and you have saved your stake. You will only succeed at this sytem if you make it a daily exercise. 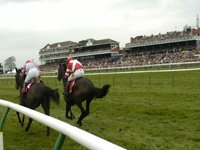 You will soon find your way round the racing pages and it shouldn't take you more than half an hour to get everything weighed up. So if you have to get up half an hour earlier, well then, what could be finer than your racing pages and a cup of your favourite caffeine taken in the peace and quiet of the early morning so you can settle to the pleasures of working on your horse racing and betting system and the daily battle with the handicapper. He may win many battles with you, but as you become battle hardened you will be the one winning the Wars each season".